Everyone deserves the chance to get away. Make your vacation a memorable experience when you come stay with us at Wildfire Ranch! 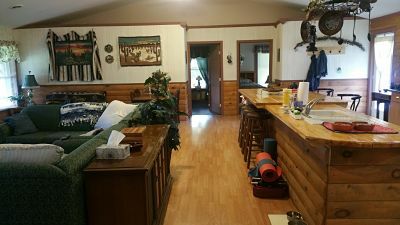 Stay in the cozy and contemporary Ponderosa Lodge, a luxury log cabin that will make you feel right at home, while you enjoy the amazing sights of Bald Eagle State Forest and breath-taking countryside just a stone's throw away. Whether you're just looking to relax or want to take an exciting horseback trail ride up the side of a mountain, there's something for everyone. The Ponderosa Lodge - Our 1,500 sq. 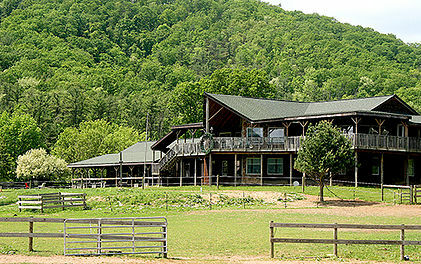 ft. log-sided lodge filled with windows looking out onto the horses at pasture! The Ponderosa sleeps up to 10 guests and features a master bedroom with King bed and single bed; 2nd bedroom with 2 single beds; living room with Queen sofa sleeper and 2 love seats sleeping one guest each; an enormous kitchen with cathedral ceilings looking right into the living room; dining room area and reading nook, full bathroom and laundry room. The lodge is fully-stocked with everything down to the toilet paper and paper towels so that all you need bring is food. A campfire pit and 1,400 sq. ft. covered deck complete the experience. Lodging in Ponderosa Lodge: $175 per night for 2 guests on weekdays; $200/night for 2 guests on weekends. Each additional guest is $50/night. Whispering Winds Guestroom - This simple but elegant guestroom features a 4-poster Queen sized bed, office desk and chair, entertainment center with Dish Top 150 channels, Wi-fi, coffeemaker, microwave and hotel-sized refridgerator. A private full bath is attached to your Whispering Winds Guestroom complete with bathtub for soaking tired muscles after a horseback trail ride. 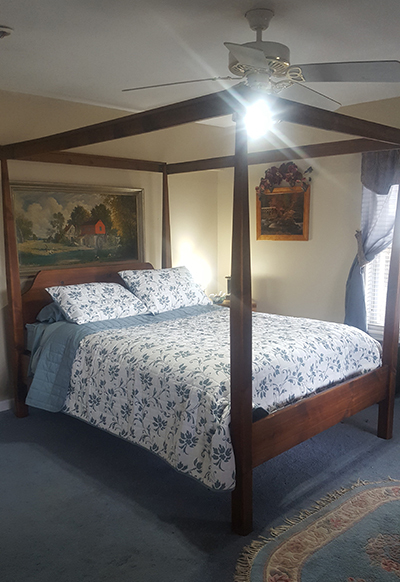 A huge country breakfast is included each morning of your stay with this beautiful guestroom! Our breakfast menu includes organic scrambled eggs with melted cheese, cinnamon raisin bagels with Amish homemade rolled butter, bacon and orange juice. Guests are welcome to use the campfire pit for night-time fires and the Ponderosa Deck for relaxing all throughout your stay. Whispering Winds rents for $115/night for one guest; $125/night for 2 guests. 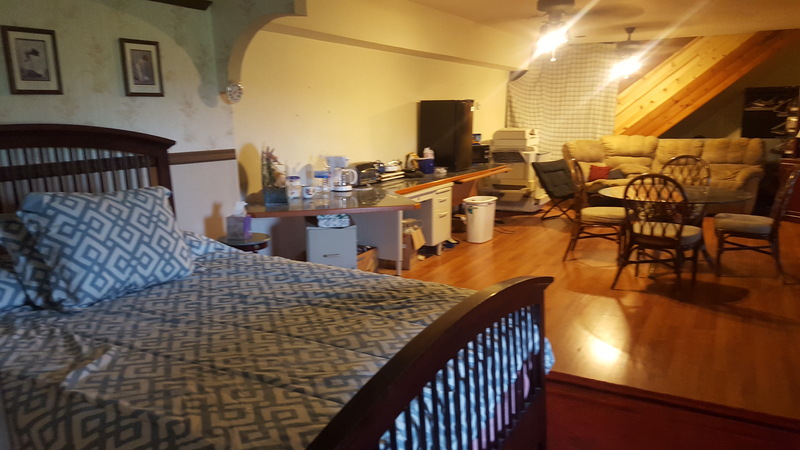 Amish Country Apartment - This spacious Amish-themed apartment features a full/twin bed, two single beds, office desk and chair, kitchen area with hotel-sized refridgerator, coffee-maker, microwave oven, toaster oven, portable stove-top burners. A beautiful dining room table with 4 chairs sets in the middle of the kitchen area looking right into the living room area with sofa, coffee-table and lamp. Large trapezoid windows look out onto the horses at pasture. 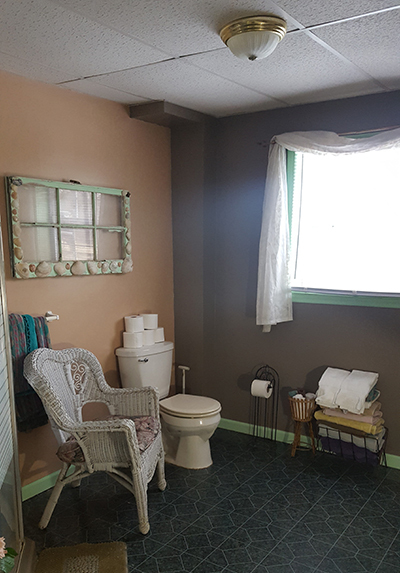 Spacious and private full bath is right beside the kitchen. 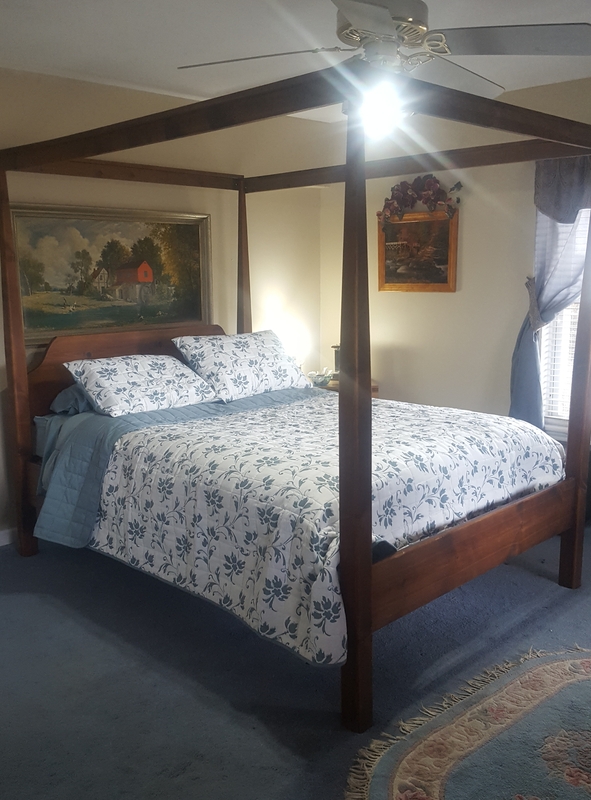 A huge country breakfast is included each morning of your stay with this charming efficiency apartment. Our breakfast menu includes organic scrambled eggs with melted cheese, cinnamon raisin bagels with Amish homemade rolled butter, bacon and orange juice. Amish Country rents for $130/night for one guest; $150/night for 2 guests. We are pleased to offer trail rides that allow you to walk, trot and even canter your horse during the course of the ride. Learn more about how our trail rides can make your stay at Wildfire Ranch a memorable experience. Horse Therapy Sessions - experience the wonder of healing from depression, anxiety and anger through horses! Our equine therapy sessions have proven life-changing for hundreds of people who admitted to us that this was their 'last resort' after trying years of traditional therapy. First sessions are always 2 hours @ $40/hour; each session after is one hour @ $40/hour. 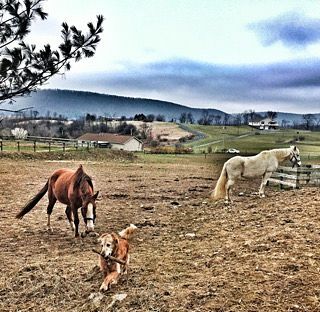 Horse Heaven - Do you plan on someday owning your own horse or even your own ranch? Learn everything you have always wanted to know about horses, from how to feed them and care for their daily needs to understanding horse behavior. Take riding lessons to become a safe and confident rider. Learn about the operations of a horse ranch from purchasing hay and feed to maintaining barn stalls and feed rooms. These wonderful teachings are perfect for the horse-lovers who know that life is better when horses are in it! $25/hour. No matter whether you're needing to get away with a weekend or you're looking for some genuine adventure, Wildfire Ranch is the place to be! Escape from the hustle and bustle of city life and spend 24 hours at our beautiful horse retreat! Our City Slicker overnight includes one night's lodging for 2 guests in our guestroom plus country breakfast. Country breakfast menu includes scrambled organic eggs with melted cheese, bacon, cinnamon raisin bagels with rolled homemade Amish butter and Orange Juice. 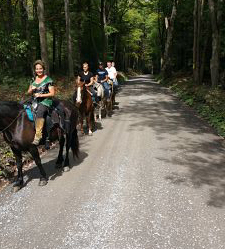 Then its a 2-hour mountain horseback trail ride that you will never forget. A campfire pit is available to you for night-time stories around the campfire. Another popular amenity is our 'Ponderosa Deck', a 1400 sq. ft. covered deck located on a 2nd story level with absolutely breathtaking views. Our guests love enjoying the Ponderosa for hours of reading, relaxing or cooking on the charcoal grill. $295 for two guests staying in our Whispering Winds guestroom. $380 for two guests staying in our Ponderosa Lodge. Relax for 3 days and 2 nights in one of our country guestrooms enjoying a country breakfast both mornings of your stay! Country breakfast menu includes scrambled organic eggs with melted cheese, bacon, cinnamon raisin bagels with rolled homemade Amish butter and Orange Juice. Then it's on a horse for a 2 hour mountain horseback trail ride adventure. A campfire pit is available to you for night-time stories around the campfire. Another popular amenity is our 'Ponderosa Deck', a 1400 sq. ft. covered deck located on a 2nd story level with absolutely breathtaking views. Our guests love enjoying the Ponderosa for hours of reading, relaxing or cooking on the charcoal grill. $420 for two guests staying in our Whispering Winds guestroom. $580 for two guests staying in our Ponderosa Lodge. How would you like to live on a real horse dude ranch for a 6 day and 5 night getaway? By popular demand Wildfire Ranch is now offering Heartland Week-Long Retreats for our guests wanting to live on our horse ranch. 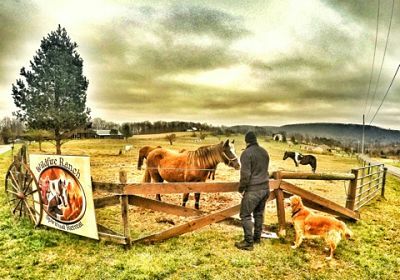 During your dude ranch experience you will receive equine therapy for depression and anxiety (if desired) or you can just choose to experience horse ranch life daily. 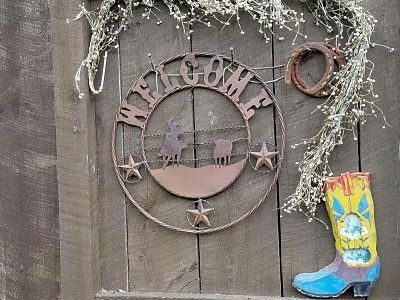 A typical dude ranch day is filled with barn chores like calling the horses in from pasture and thrilling to the thunderous sound of their hooves as they gallop in as well as feeding and watering and mucking stalls afterward. Then it is on to the fun activities which involve one-on-one contact with the horses as you learn to groom and tack them for riding. Additionally, you will learn all about horse behavior and the various breeds; the difference between English and Western riding styles; and how to walk, trot and canter any horse in any style. Everyday during your dude ranch retreat you will either be receiving the enormous benefits of horse therapy for depression or experiencing unforgettable horseback trail ride adventures into the Bald Eagle State Forest. We will mix in a few horse lessons in our ring for those who want to better their riding skills and even horse training lessons for our guests dreaming of running their own ranches. To add some luxury to your week we include one massage therapy session with a professionally-licensed therapist nearby! For those seeking healing from depression, spend 6 days and 5 nights on our ranch while receiving daily equine therapy sessions. Discussion sessions twice during the week will ensure that you are receiving the full benefits of your horse therapy sessions. In between therapy sessions you will receive horseback riding lessons and even trail rides into the state forest! Breakfast provided daily. Breakfast menu includes scrambled organic eggs with melted cheese, bacon, cinnamon raisin bagels with rolled homemade Amish butter and Orange Juice. A Campfire pit is available to you for night-time stories around the campfire. Another popular amenity is our 'Ponderosa Deck', a 1400 sq. ft. covered deck located on a 2nd story level with absolutely breathtaking views. Our guests love enjoying the Ponderosa for hours of reading, relaxing or cooking on the charcoal grill. Three (3) hours daily of your choice of horse therapy sessions, horseback trail rides, horse riding lessons or horse-training sessions. If raining we will substitute with in-barn activities. 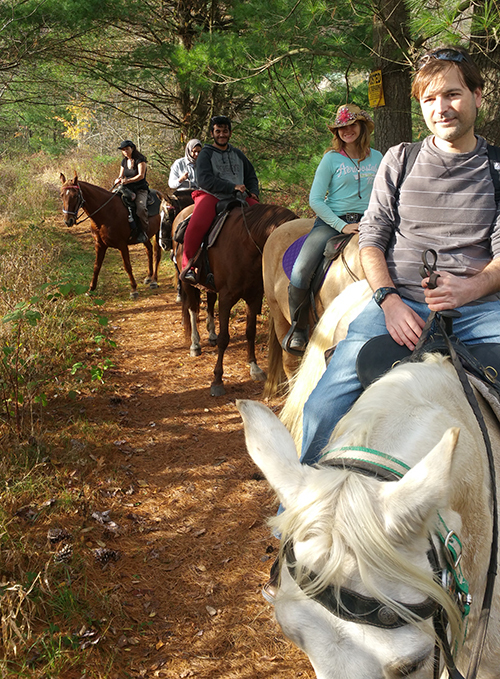 One (1) guaranteed horseback trail ride adventure into the Bald Eagle State Forest. One (1) hour daily participation in ranch work including brushing and feeding horses. Two (2) discussion sessions to understand the effects of the horse therapy. One (1) massage therapy session from a nearby professional therapist. You will participate in all of the daily activities on our horse dude ranch while receiving equine therapy for anxiety, depression and despair, if needed. 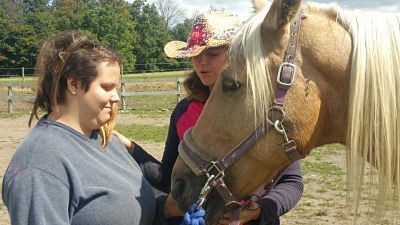 Learn more about the Week-Long Horse Therapy Retreat.